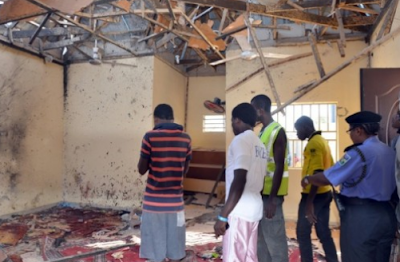 Five people have been reported killed in a teenage suicide bomber who attacked a Mosque where his father worships in Gamboru in Gamboru –Ngala local government of Borno state. The incident occurred on Wednesday at 5: 00 am when the a teenage male bomber who had disowned his father detonated an Improvised Explosive Device (IED) in the Mosque. Maj.-Gen. Rogers Nicholas, the Theatre Commander, Operation Lafiya Dole of the Nigeria Army, confirmed the attack. He added that the troops had also neutralized a suicide bomber at Rann, headquarters of Kala-Balge local government area. “Yes, but only 5 killed and another suicide bomber neutralized in Rann”. However, Mr. Lawan Abba, a resident of Gamboru, said six others sustained injuries in the attack. Abba disclosed that the suicide bomber sneaked into a crowded mosque while people gathered to observe Morning Prayer and detonated the explosive. He revealed that the teenage suicide bomber hailed from Gamboru town, adding that the father of the assailant was among the 10 persons, who lost their lives in the attack. “The suicide bomber disowned his parents and joined the insurgents in the bush. Abba added that the wounded persons were referred to the clinic in the Internally Displaced Persons (IDPs) camp in the area for treatment. An eye witness, Bukar Fantai, told NAN that the bomber managed to sneak into the village disguising as a grain merchant.